A dental implant is a small titanium screw that serves as the replacement for the root portion of a missing natural tooth. 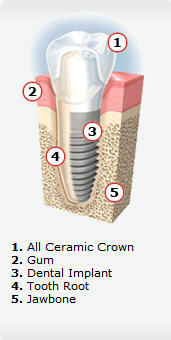 Dental implants can be placed in either the upper or lower jaws. Due to the biocompatible properties of titanium, a dental implant fuses with the bone and becomes a good anchor for the replacement tooth. Dental implants can be used in solutions for replacing a single tooth, multiple missing teeth, or full arch replacement (all teeth missing). Occasionally, older patients express concern that their age may prevent them from enjoying the benefits of dental implants. Health is more of a determining factor than age. If you’re healthy enough to have a tooth extracted, you’re probably healthy enough to receive dental implants. Certain chronic diseases may contraindicate dental implant treatment. Your periodontist will determine if you're a candidate for dental implants after careful evaluation of your dental & health history. Several factors, such as your dental health, the number of teeth involved, which teeth are replaced and whether additional procedures may be required prior to the placement of your dental implants will determine the number of visits to the periodontist throughout the treatment period. Contact our Shreveport dental practice for more information or to schedule a consultation.